Everton Signs Barca Left Back Lucas Digne for £22 million. 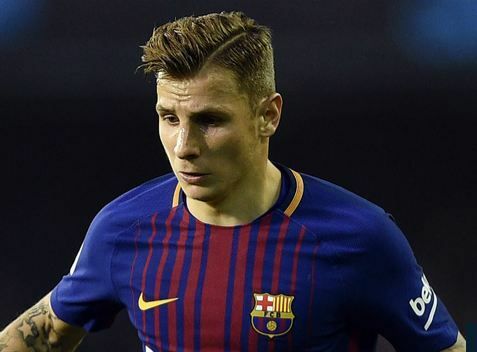 French Barcelona fullback, Lucas Digne, has thanked the Catalan clun for ‘dream come true’ as his £22 million transfer to Premiership side, Everton, nears. Digne posted a goodbyemassage to Barca fans on Instagram yesterday and and wished them all the best for next season. He posted; “The last two years have been a childhood dream that I have been able to realise,” the France international wrote on Instagram. “I want to say thank you very much to all. “First, to the club that has given me everything since I arrived. “The crowd that is always behind the team and that has given me a lot of warmth during the last two years. “The city of Barcelona that will always stay with me for what I have lived and for the people who are always incredible. “And finally my colleagues, who before being the best players in the world are amazing people who always help you. “All this to say that Barca is more than a club, it is an incredible family. Digne made 46 appearances for the Catalan side over his two seasons since joining from Paris Saint-Germain, playing just 12 times in La Liga last term as he was unable to dislodge Jordi Alba from the left-back slot.